The most historically important boxing match of the last 30 years took place on this day in 1987, as Sugar Ray Leonard came out of retirement to capture the undisputed middleweight title from Marvelous Marvin Hagler, via split decision. Leonard was the golden boy of boxing’s last golden age. He won Olympic gold in Montreal in 1976 and was already a household name by the time he turned professional. Leonard fought just 40 times in his career and is sometimes denigrated by uninformed fans due to that relatively low total. In truth, he is one of the elite fighters of all time, and the quality of his resume is beyond reproach. Between November 1979 and September 1981, he fought seven times, against opponents with a combined record of 311-7-1. Three of the opponents in those fights were undefeated world champions. Two of the fights were against Roberto Duran, arguably the greatest lightweight of all time, who had lost just once in over 70 fights. Hagler’s march to immortality was far less direct. When he finally captured the undisputed middleweight title by knocking out Alan Minter in 1980, he had been the most avoided fighter in the sport for years. Once he claimed his crown, he established himself as one of the elite prizefighters of a brilliant era and one of the top three middleweight champions in history. By 1987, Hagler had developed into a true mainstream star. With his chiseled physique, bald head and goatee-framed scowl, he was a true sports icon. When Leonard came out of retirement to face him, few gave the former welterweight star much chance. Hagler had knocked out 12 of his previous 13, with only the incredibly rugged Duran going the distance against him. His 1985, three-round TKO of Thomas Hearns might have been the most exciting seven minutes and 52 seconds of boxing history. Leonard had fought just once in the previous five years, looking entirely unimpressive during his 1984 stoppage of Kevin Howard. But Leonard fought a tactically brilliant battle against Hagler, to steal the belt in an incredibly close fight. He provided Hagler with an elusive target all night and fought in calculated flurries, late in rounds, to earn them on the cards. Hagler’s pride led him to fight Leonard’s fight early on, and in my estimation, he gave away the first four rounds. Hagler clearly won the last two-thirds of the fight, but by a very close margin. Judge Jose Juan Guerra, who scored 118-110 for Leonard, had to have filled his card out the night before. 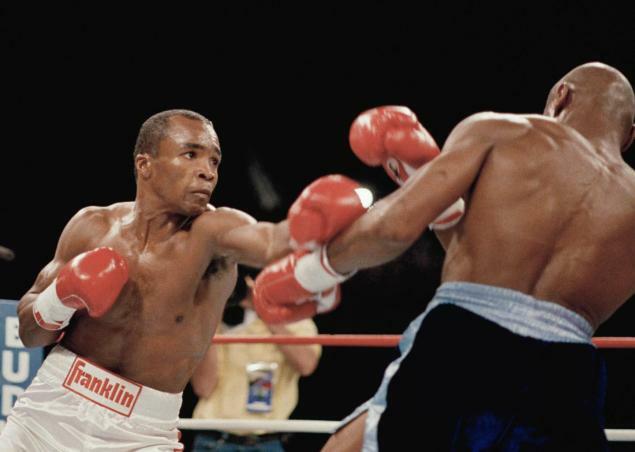 But judges Lou Filippo, who came in 115-113 for Hagler, and Dave Moretti, who scored the opposite in favor of Leonard, were both entirely reasonable. Despite the fact that Hagler was my favorite boxer at the time, I still scored it 115-113 for Leonard. To this day, the fight is one of the most debated in history.